What Does California Foreclosure Law Mean for My Home? 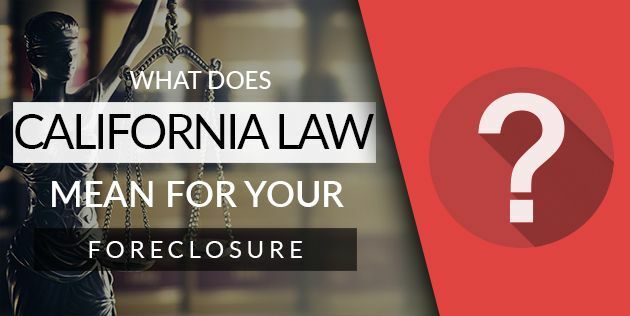 What Does California Law Mean for My Foreclosure? Home » Blog » What Does California Law Mean for My Foreclosure? Thanks to some merciful lawmakers, California homeowners are provided with legal protections when their lender begins the foreclosure process. These laws came into effect as the California courts’ response to the housing crisis, where many lenders were found at fault for forming unsuitable deals with home buyers. California doesn’t want a repeat performance of this fiasco, and the One-Action Rule and the Bill of Rights are working on your side during this difficult time. Lenders want their money, and they’ll stop at nothing to recover their investment. This sometimes leads to lenders attacking homeowners with defaulted mortgages in several ways at once. The One-Action Rule forces lenders to pick one of three actions, rather than allowing them to throw the book at you. This means you can’t be hit with a foreclosure in conjunction with a personal lawsuit. Non-judicial foreclosure is the most common method a lender will use to recover their debt. Rather than going through the courts to obtain their investment back, as well as any difference you may owe, the lender will take your home back and sell it. The lender will not be able to collect the difference between the selling price and what you owed, since they’ve bypassed the courts. Most lenders prefer non-judicial foreclosures because they’re less expensive. Rather than dealing with court costs, representation, and debt collection agencies, the majority of lenders would rather cut their losses. It’s the most economically efficient option for the lender to let the difference go. Judicial foreclosure takes a long time, and unless you owe a tremendous amount of money on your mortgage, your lender probably won’t want to go that route. In this scenario, your lender will petition the court to formally repossess your home. Once they’ve sold your home, you will be mandated to pay the difference between the selling price of the home and the total amount of your mortgage. Judicial foreclosures end in debt, and they’re much harder for both parties to handle. This is only used in rare cases, if at all. It’s an unusual situation that hardly comes up, but it’s possible that it will under California’s Security First Rule. Lawsuits are an alternative traditional foreclosure. Your lender is highly unlikely to do this, but they actually have the ability to sue you over your promissory note. After they’ve pursued your real estate, they’ll file a personal lawsuit for the balance of the debt. What About Second and Third Mortgages? If you have multiple mortgages or a HELOC, these are affected by your foreclosure. During your foreclosure, your additional mortgages and HELOCs (called junior lien-holders) also become foreclosed. These lenders are now at a loss due to your foreclosure, and they have the right to pursue you as well. These lenders can personally sue you on your promissory note. They get an action, too. If your home’s equity isn’t larger than your debt, your junior lien-holders will have to come after you directly. If your other mortgages were backed by the same company as your first mortgage, action can’t be taken against second and third mortgages. Purchase-money loans and seller-financed loans are invalid during foreclosure. You cannot be personally sued for these debts. These rights were written to provide homeowners with transparency as it pertains to lending, borrowing, and foreclosure. This list of laws makes the playing field fair for homeowners by eliminating a lender’s options to bully them during foreclosure. The elimination of dual tracking can help you postpone foreclosure. Even if your lender denies your first request for a loan modification, you can submit an appeal when you receive the notice. Lawmakers wrote these laws to prevent you from getting the runaround. When you’re frantically making phone calls attempting to save your home, you cannot be passed from representative to representative. You won’t have to explain your situation repeatedly, and you won’t receive different answers. You will be assigned a contact through the lender who is responsible for all of the details of your case. This person will provide you with necessary information regarding prevention plans and modification programs the lender offers. Her or she will be able to connect you with the people responsible for making the foreclosure decision. Robo-signing is exactly what it sounds like. It’s when member of your lender’s organization signs foreclosure documents before reading them. All documents need to be verified, and the signer needs to be personally aware of your situation. If a lender is caught robo-signing, they’re liable for a penalty of up to $7,500 for mishandling your foreclosure documents. If your lender breaks the law when handling your foreclosure, you can to sue them for damages. In some cases, the foreclosure can be stopped due to misconduct. If the foreclosed home has already been sold, you may be awarded cash. If the lender is found to have broken the law on purpose, or there is proof that the lender was sloppy, you may also be awarded statutory damages of up to $50,000. Make sure you’re familiar with the foreclosure process. You should be carefully monitoring your lender’s conduct. You may have defaulted on your mortgage, but you still deserve fair protection under the law. In many cases, selling your home to avoid foreclosure is often the best course of action for many home owners. « Previous Post What Will Foreclosure Do to My Credit Score? Next Post » Can I Safely Sell My Home Before a Foreclosure?